Dr. Eden Y Woon (left) and H.E. Mr. Ahmad Rusdi. The donation by CSI President and CEO Mr. Ashraf Habibullah follows deliberations with Dr. Naveed Anwar, Executive Director of AIT Solutions during the 7th Asia Conference on Earthquake Engineering (7ACEE) organized by AIT in Bangkok. Dr. Anwar informed Mr. Habibullah about AIT’s activities and support in the immediate aftermath of the Sulawesi disaster. Participants at the Conference were also encouraged to donate to the disaster victims. 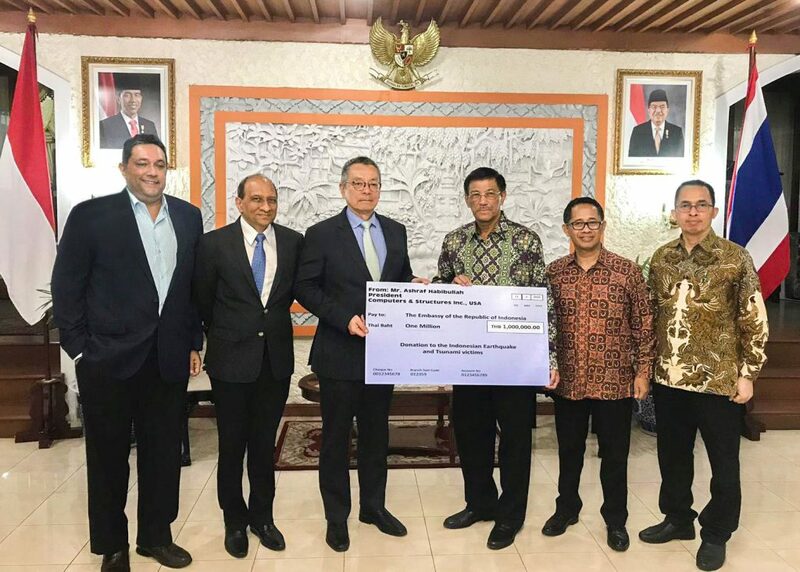 Mr. Habibullah announced a one-million-baht donation to the Sulawesi victims and followed this with an additional one million baht for disaster relief support activities organized by AIT. 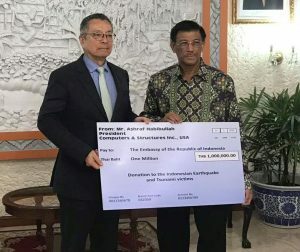 The one-million-baht donation for victims of the Sulawesi disaster was handed over to the Ambassador of Indonesia to Thailand, H.E. Mr. Ahmad Rusdi by AIT President Dr. Eden Y. Woon on 11 January 2018. President Woon was accompanied by Dr. Naveed Anwar, Executive Director, AIT Solutions, and Mr. Sanjeev Jayasinghe, Director, Office of Advancement.